The Kid (marketed as Disney's The Kid) is a 2000 American fantasy comedy-drama film, directed by Jon Turteltaub and written by Audrey Wells. It stars Bruce Willis and Spencer Breslin, with Emily Mortimer, Lily Tomlin, Chi McBride, and Jean Smart playing smaller roles. The film was released by Walt Disney Pictures on July 7, 2000 in the United States and received mixed reviews from critics. The film was a financial success, grossing $110 million. Russ Duritz works as a successful but impolite image consultant in Los Angeles and has a strained relationship with his father. One of his clients is a stadium manager who is reneging on a previous promise to fund a baseball camp for disadvantaged children. When Russ makes a pie throwing video to fabricate an explanation, his coworker Amy urges him to reconsider. When Russ returns home to find a toy plane on his porch, he assumes it is a gift from his father. However, inside he finds a strange boy, and chases him through the streets. After seeing the boy enter Skyway Diner, Russ runs in and finds no sign of him. Believing the experience to be a hallucination, Russ frantically sees a psychiatrist for medication the next day, but finds the same boy on his couch eating popcorn and watching Ed, Edd n Eddy when he returns home. The boy says his name is Rusty, that he was just searching for his toy plane, but came across the popcorn. Starting to see a resemblance, Russ begins comparing memories and birthmarks with Rusty, and figures out that the boy is actually himself as a kid. After a series of probing questions about Russ' life, Rusty tells him, "I grow up to be a loser." Amy finds out about the boy the next day and starts to think that Russ and Rusty are father and son. After she accuses Russ of being a dead-beat dad, Rusty assures her he is not Russ’ son. Rusty implores Russ to tell Amy the truth about their identities, but Russ thinks she'd never believe them. Amy discovers the truth on her own while watching the two argue; Russ, and Rusty are nearly identical in style, and intensity. When Amy finds out that Russ lied about airing the stadium manager's tape, she gets mad at him and leaves disappointed. Russ cancels his appointments the following day, and spends the time walking with Rusty, and driving around the city trying to figure out why Rusty is there, and what from the past needs to be fixed to get Rusty back home. As they drive through a tunnel, Russ recalls a fight he lost with some neighborhood bullies who were abusing a three-legged dog named Tripod. They emerge from the tunnel to find themselves reliving Rusty's eighth birthday in 1968. Russ helps Rusty win the fight and save Tripod, but suddenly remembers that because of the fight, his sick mother also came to school for him that day. When they get home, Rusty's father angrily shakes and scolds him for getting into trouble and causing his mother more stress. Rusty cries while attempting to tell his father that he found a screw he lost, but his father tells him to grow up while rubbing Rusty's tears away harshly, causing a lifelong facial tic. Russ tells Rusty that his mother will die before his next birthday, then comforts him. Tearfully, Russ tells Rusty that his father's outburst was because his dad was scared that he didn't know how to raise him alone, and also assures Rusty that he was not responsible for his mother's death. The two go to Skyway Diner, and celebrate their birthday. When a dog named Chester greets Rusty, they find out that his owner is an older version of Russ who owns planes, and has a family with a woman who is clearly an older version of Amy. Realizing that Rusty's appearance was meant to change his ways rather than the other way around, Russ returns to his time, arranges plans to see his father, buys his assistant tickets to Hawaii, and, with a puppy, returns to Amy, who invites him into her home. Disney's The Kid opened at #4 at the North American box office, making $12,687,726 USD in its opening weekend, behind The Patriot, The Perfect Storm, and Scary Movie. The film eventually ended its run by grossing $69,691,949 in North America and $40,625,631 elsewhere, thus bringing its worldwide total to $110,317,580, against a $65 million budget. Upon its release, the film received mixed reviews from critics. Review aggregator website Rotten Tomatoes calculated a 49% overall approval rating based on 97 reviews, with the consensus being, "Critics find The Kid to be too sweet and the movie's message to be annoyingly simplistic." On Metacritic, which assigns a normalized rating out of 100 to reviews from mainstream critics, the film has received an average score of 45, based on 32 reviews, which represents "mixed or average reviews". Audiences polled by CinemaScore gave the film an average grade of "A-" on an A+ to F scale. 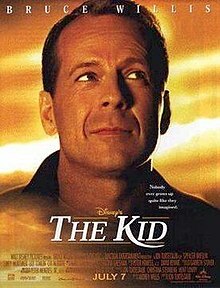 Film critic Roger Ebert of the Chicago Sun-Times gave the movie 3 stars out of 4, observing that "Disney's The Kid is warm-hearted and effective, a sweet little parable that involves a man and a boy who help each other become a better boy, and a better man. It's a sweet film, unexpectedly involving, and shows again that Willis, so easily identified with action movies, is gifted in the areas of comedy and pathos: This is a cornball plot, and he lends it credibility just by being in it." Film critic A. O. Scott writing for The New York Times observed: "Mr. Willis stands by while a child swipes a movie out of his open palm ... Spencer Breslin, Russ's tubby, cute-but-annoying almost-8-year-old self." The Kid was nominated for three awards, winning one. For his role in the movie, at the 22nd Young Artist Awards presented by the Young Artist Association Spencer Breslin won the 2000 Young Artist Award for Best Performance in a Feature Film by a Young Actor Age Ten or Under. He was also nominated for the 2001 Saturn Award for Best Performance by a Younger Actor awarded by Academy of Science Fiction, Fantasy and Horror Films, and the 2000 YoungStar Award for Best Young Actor in a Comedy Film, presented by The Hollywood Reporter. ^ "DISNEY'S THE KID (PG)". British Board of Film Classification. September 19, 2000. Retrieved December 23, 2015. ^ a b c d "The Kid (2000)". Box Office Mojo. Retrieved July 7, 2007. ^ "The Kid (2000)". Rotten Tomatoes. Retrieved May 23, 2014. ^ "The Kid Reviews". Metacritic. Retrieved May 23, 2014. ^ Ebert, Roger (July 7, 2000). "Disney's The Kid Movie Review (2000)". Retrieved May 23, 2014. ^ "Awards for The Kid (2000)". Internet Movie Database. Retrieved July 7, 2007.